Psydrozon is a giant robot created by Evilfatsozon and controlled by Pretzel Head. Psydrozon has one eye and two swords and he chops down buildings. His body is now used by Axe Cop and Dinosaur Soldier to fight crime. Powers: robot powers, one eye, two swords. Iron Spider Cannon saves the day. The only way to defeat Psydrozon. What kind of robot could beat an elephant? The gang of heroes goes to the alien planet to fight the aliens who threw Uni-Baby at the earth. 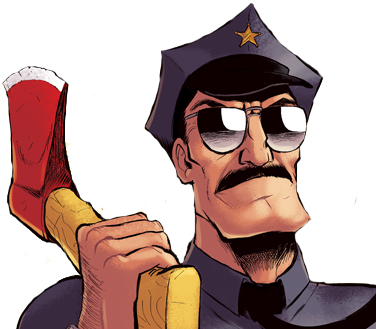 Axe Cop holds more try outs- but wait! Psydrozon is outside!